Games are a fundamental factor in the development of (human) culture, says cultural historian Johan Huizinga in his 1938 book Homo Ludens (the playing human). He shows how centuries ago, cultural systems have developed from playful modes of behavior, and how the people could escape death by starvation merely by distracting themselves with playing games. Today, digital games have gained a strong foothold in society. The latest example is the success app of 2016: Pokemon Go, where users are hunting the yellow monster Pikachu and his friends. Pokemon Go generated a hype that traversed all age groups and drew people and their smartphones outside, in any wind and weather. Gamescom 2016 | © Steven Aang The app enables players to see a view of reality through the camera of their smartphones, enhanced by elements of the game. In this augmented reality, monsters (pokemons) appear at certain locations and can be caught by throwing digital balls (pokeballs) at them. Despite the instant boom, the number of active players decreased after two months. Pokemon Go lacks elements of the game that keep players interested for a longer period of time. The revenue brought in by the game in just two months, however, not only makes developers Niantic and Pokemon Group happy, but also future investors. It shows that location-based games with AR technology can work perfectly in combination with the right brand and an appealing concept. In August 2016, more than 345 000 visitors from 97 countries came to the Gamescom in Cologne, the biggest exhibition for games and interactive entertainment worldwide. For five days, international experts, gamers and game enthusiasts came together to test the newest games. 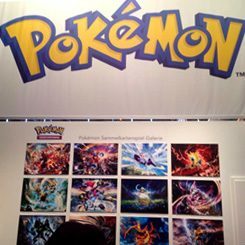 In the exhibition halls, one could find AAA games like The Legend of Zelda, Mafia 3, Overwatch and Watch Dogs 2, that have been produced and distributed by publishers for a mass audience with a budget of several hundred millions of Euro, mostly overseas. But at the exhibition, visitors could also take a look at indie games, which are mostly developed by smaller teams, and independent from big publishers and exorbitantly huge marketing budgets. The Indie Arena Booth at the last Gamescom, spread across 620 square meters, featured 60 indie developers from 18 countries. The selection was quite impressive: one could find just about anything, from text adventure Code 7 to games that could be played with virtual reality headsets. In FAR: Lone Sails, players become an adventurer, whose vehicle must constantly be repaired in order to continue the journey. In The Inner World, a classic point and click adventure, players rescue the flute noses of Asposia together with Robert and Laura. Multiplayer games like Shift Happens which is played in co-op mode (two players play together) and Oniri Islands where two players solve puzzles with real haptic meeples on a tablet, also enthused the audience. The Holocafé will become Europe’s first “local multiplayer VR” arcade. Similar to the arcade halls with slot machines, the Holocafé will be a place for VR players. Here, one can book rooms featuring VR headsets and play specially developed VR games for 2 to 4 players, such as the multiplayer archery game which would be possible in a setting like this. There are of course also games are not necessarily available in shops. In Germany, for instance, simulation games such as the farming simulator, are extremely popular, among the developers as well as the players. “Serious Games” that are especially developed to transfer learning content, are increasingly used as teaching material in vocational education and training, like for recruitment purposes of companies or internal seminars and training of big corporations. Even in the health-care sector, recent research has shown that games have a positive effect on rehabilitation and can even be used as replacement for tranquilizer before surgery. This eases the daily routine of physicians and nursing staff, and at the same boosts the patients’ participation in therapeutic or rehabilitating exercises, as the game Patchie has shown . It seems that games in the modern age can increasingly be seen as a fundamental factor in the development of human culture - in the sense of Johan Huizinga - and will play an even more important cultural role in the future. and Marcus Bösch founded The studio The Good Evil GmbH in2013 in Cologne. She and her team specialize itself in newsgames, games for museums and science games. One of these games is the award-winning language learning adventure Squirrel & Bear.